We’re excited to be sharing with you our interview with Adam Palmer, who is a freelance writer who has published multiple novels and is currently composing a novel entirely on Twitter. But we’ll shut up no and let him tell you about himself. Read on past the break for this exclusive interview. Into the Book: You’re writing a yearlong novel, Space Available, entirely on Twitter. What gave you the idea for such an unusual delivery? Adam Palmer: Being a freelance writer by trade, I have to work to get work, if that makes sense. I can’t just hope it comes to me; I have to connect with the outside world in as many ways as possible and make as many connections as I can in the hopes of drumming up business. As Facebook and Twitter began to encroach further and further into our society, I reluctantly began to accept their validity and signed up. I’m not much of a narcissist (I hope!) and I’m not very good at self-promotion, but I knew that I needed to have a presence in both of these areas. I’ve done Facebook for awhile, though I generally just use it to inject a thought-provoking quote into the self-focused staleness that is social media. I came to Twitter much later and actually found myself liking it more than Facebook. With no pressure to comment, no pictures to look at–it’s just raw words. It forces brevity and succinctness. It’s a writer’s dream. I started to realize that individual tweets are really just snippets of a story–the story of that person’s life. Taken together, you get to see a larger glimpse of that person, or at least which part of them their Twitter feed represents. Once I started looking at Twitter as a storytelling mechanism, I was on the way to writing my novel. ITB: How has publishing this novel on Twitter changed the way which you are writing the book? AP: Writing on Twitter changes everything. I’ve written two novels other than Space Available, and in both of those cases, the final draft of was far different from the first draft. Some characters that were in the first draft weren’t in the final; some where combined into one for streamlining purposes; some plot motivations were changed; word choice was different; I could go on and on. The joy of writing a first draft is that you can go anywhere you want with no limitations and no worries. Have a character that isn’t working? Kill ’em off. Need to pick up the pace? Send some ninja crashing through the window. There is only one rule: keep going. You may know where you’re headed, but you don’t know how you’ll get there, so you just keep writing and writing until you reach the end. Then in the edit, you go back and clean up all the debris and make it look like you intended to do that the whole time. 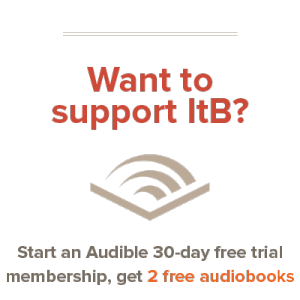 ITB: Space Available has a distinct style of twists that is suited to its short delivery – what gave you the idea for this novel? Are you the type of author that plans far ahead in intricate detail for your novel or do you just have a vague plan for where it’s going? I got the idea from a friend of mine, Jeff Gerke, who had it long ago and asked me if I’d be interested in writing it. He runs a website called WhereTheMapEnds.com that specializes in Christian speculative fiction and has a knack for these types of creative ideas. I didn’t really have the time nor the inclination to do another novel, so I passed on it. Fast-forward a few months and now I’ve decided to write a novel in Twitter, and I’m starting to think about what type of story I want to do. I knew I wanted it to be different from any of the novels I’ve done before, but I didn’t know much beyond that. And then I remembered this concept Jeff had, told him my idea for writing it over Twitter, and he loved it. Not only did he give me his blessing, but he gave me a contract to publish it through Marcher Lord Press, his publishing house. They’re also hosting the book over there, updated every Monday for those who want to catch up on it. That’s at this link. As for the plan-ahead-type stuff: like I said before, I know where I’m going but I’m not entirely sure how I’m going to get there. Like, one thing I wasn’t anticipating was the episodic style it’s winding up having, which just came naturally as I started writing it. I try to cover just one big point each time I write, and then leave it just at the conclusion of that point, or when it feels like it’s trying to segue into something else. Sometimes I do cliffhangers, and sometimes I just end it on an anticipatory note. ITB: What got you started in writing? What writers inspired you or got you interested in writing? AP: I started writing way back around the Industrial Revolution, when writing was done either by hand or on this gangly contraption called a typewriter. We had one such contraption in our house, stowed in a closet. My mother got it out to type a fancy-schmancy letter that had to be just-so, and she left it out for some reason or other. I was in the fifth grade or so, and I dialed some paper in there and then wrote a play. My fifth-grade version of Robin Hood. It ran four pages and was never produced. But that was the start. I began to realize that writing came easily to me and began to rely more heavily on it, especially when I hit college. I read a lot of music and movie reviews back then and got an opportunity to start reviewing videos for a niche Christian magazine at twenty bucks a pop. I was still in college and that was my first paid writing gig. From there I began to build a body of work and managed to parlay it into a full-time job at a niche marketing firm. Baby steps upon baby steps and then I wound up where I am today, writing books. As for writers who inspired me to write: there’s only one answer there. C.S. Lewis. I became a writer because of The Silver Chair. That was the first of the Narnia books I ever read, and it completely blew my young mind. I had no idea that a story could do that to a reader–create an entire world with high stakes and rich characterization. That really was the first time I realized the power of story, and that was when I decided that, at some level in my life, I want to do this. AP: I generally write in coffee shops, when I can afford it. I like being surrounded by the din of conversations, the whir of the baristas steaming milk, the occasional wet clunk of the ice scoop. I like the electricity of humanity in those types of environments, and I really enjoy a good cup of coffee to go along with my writing. I always put on headphones and some non-intrusive music–for some reason the extra noise helps me to focus. I think it drowns out my internal senses; if it’s too quiet, I can hear my own heartbeat and that gets distracting. I am a very routine-oriented person, so I try to maintain one as I can. This can be difficult when you have five children and one car, but I do my best. Since I’m a full-time writer, I write from roughly 8 to 5 on weekdays, and I take an hour or two to have lunch with the family. I jealously guard my nights and weekends and do all I can to make that be family time, but if I have a deadline looming, I’ve been known to work in those off-hours to bring a project to completion. When I’m working on a regular novel, I do set daily goals, but Space Available is such a different animal that I don’t have a daily goal for it, I have a weekly goal. I try to work on it at least three times per week, though I haven’t been reaching that lately. We’ll see as the year progresses if I can get back on track (hint: I will). ITB: If you could pass along one piece of writing advice, what would it be? AP: Do it because you love it; being a writer is not a very good way to make money. I’m a full-time writer, but I also live a very simple life, and I seldom get to write what I truly enjoy writing. I am fortunate to be working on a project currently that I believe in, but it’s still someone else’s story, not my own. So if you want to write, you have plenty of opportunity now to get your stuff out there, but please, for all our sakes, only write because you love to. Thanks so much Adam, we really this opportunity for an interview. Thanks for stopping by, and we look forward to your novel’s completion. If you’d like to read more about Adam, you can do so at his personal blog, Adam Palmer, Author. I admit, before I saw this I had never heard of this guy. But writing a novel on Twitter? That’s awesome, but daunting, posting first drafts online! Very original. Thanks so much for taking the time to share this with us, Adam! The interview indeed was motivational as I thought it’d be. I write because I love it but Adam is wired cos he loves noisy places. As for me, I enjoy writing in quite places. Can’t wait to read that novel. You are welcome all =) Glad that you enjoyed this and I hope that we can satisfy y’all with more interviews in the future!